The Saudi prosecutor-general began the “second phase” of the country’s current anti-corruption campaign by launching a “broad investigation into those detained at the Ritz Hotel [in Riyadh] who have refused to reach a settlement” this week, a statement released by Saudi Prosecutor-General Saud Al-Majab said. The Saudi Supreme Judiciary Council, the country’s highest court, will create two new circuits, one in Riyadh and the other in Jeddah, for the proceedings, and there will be no ad hoc courts, the statement added. The announcement came after the release of several top Ritz detainees, notably Saudi Prince Al-Walid bin Talal, the wealthiest Arab businessman, according to the US Forbes magazine. The US financial news service Bloomberg reported that the Saudi authorities had released Bin Talal, owner of the Kingdom Holding Company (KHC), which owns shares in dozens of major global companies including Citibank and Twitter, after he had reached a settlement with the authorities. It quoted unnamed sources as saying Bin Talal would remain as chairman and 95 per cent owner of the giant company, which recovered on the stock market after news of his release after stock prices had fallen for months on the Saudi stock exchange. Bloomberg did not report on the amount of the settlement, although there were rumours that the Saudi government has so far collected $100 billion. In an article in the New York Times two months ago, US journalist Thomas Friedman questioned what he called “the lack of transparency” of the anti-corruption campaign launched by Crown Prince Mohamed bin Salman in November 2017. Bin Talal was released after giving an interview to the Reuters news agency, in which he said he expected to go home and take charge of his company soon. What had happened was the result of a “misunderstanding,” he said, expressing his support for the country’s leaders. 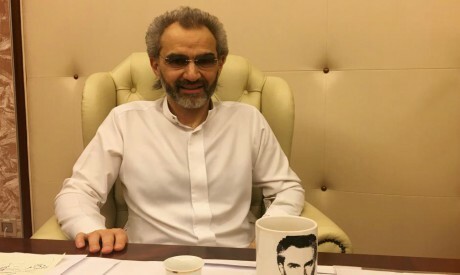 However, several Saudi accounts on Twitter under the pseudonyms “mujtahid” and “al-ahd al-jadeed” claimed that allowing Reuters to interview Bin Talal during his detention had come after the BBC had reported that the detained prince had indicated he might have been mistreated. Bin Talal appeared to be in good health and high spirits as he showed off his detention quarters at the Ritz, which has become a prison for some of the country’s economic and political elite over the past few months. Those who have refused to reach a settlement have been transferred to the Haer prison in Riyadh. Bin Talal was released along with others, including owner of the TV station MBC, which broadcasts from Dubai, Walid Al-Ibrahim, who is also related by marriage to the ruling family, retail tycoon Fawwaz Al-Heker, former chief of staff of the royal court Khaled Al-Twejri and businessman Turki bin Nasser. MBC CEO Sam Barnett sent a message to the company’s employees, seen by Reuters, saying that Al-Ibrahim had been released and reunited with his family in Riyadh. Al-Ibrahim still owns the same shares in MBC, according to sources speaking to the UK Financial Times. According to the Bloomberg Billionaires Index, Bin Talal is the richest man in Saudi Arabia with a fortune of more than $18 billion, followed by the Al-Alyan family with more than $10 billion, then Mohamed Al-Jaber with $8.3 billion, Mohamed Al-Amudi at $8.1 billion, Prince Sultan Al-Kabeer at $4.7 billion, Saleh Kamel with $3.8 billion, Suleiman Al-Rajhi at $3.6 billion, Abdullah Al-Rajhi with $2.9 billion, Adel Al-Ojan with $1.8 billion, Prince Khaled bin Abdullah with $1 billion and Nasser Al-Tayyar at $600 million. According to unnamed sources speaking to Reuters, the Saudi authorities had demanded $7 billion from Bin Talal, but there are no documented figures. Previous reports stated that Bin Talal had refused to settle because that would have been an “admission of guilt” for crimes he has denied. “The settlements require an admission of guilt in written statements, and a pledge not to repeat the offenses,” Bloomberg quoted a senior source as saying. The charges against the Ritz prisoners were never made public, and all that was said against Bin Talal was that he was accused of money-laundering, paying bribes and blackmail. “The cases against the Ritz detainees are now closed, but the anti-corruption campaign continues. I would not be surprised if more people are investigated and interrogated,” Eshqi said. The four released men now join others who were released earlier, such as Prince Meteb bin Abdel-Aziz, former minister of the Saudi National Guard and a son of the late king, his two brothers Mishaal, former prince of Mecca and Faisal, after reaching undisclosed settlements with authorities. Official sources said Meteb had left the Ritz after reaching “an acceptable settlement,” while other reports stated an unconfirmed $1 billion. Former minister of finance Ibrahim Al-Assaf and Chair of Saudi Telecom Saud Al-Daweesh were also released. Al-Assaf led his country’s delegation to the World Economic Forum in Davos this month shortly after his release and reinstatement as a cabinet minister. His going to Davos coincided with an announcement that anyone who did not settle would be referred to the prosecutor-general, signalling that Riyadh wants to reassure global investors concerned about the anti-corruption campaign. All those who were released have returned to their normal lives, and pseudonym Twitter accounts have commented that this may mean nothing has changed, with the campaign being simply a ruse to collect money. However, an informed source told Reuters that the authorities had separated cash funds from assets such as real estate and had looked at bank accounts. One businessman had paid thousands of Saudi riyals in exchange for his release, while another had surrendered shares and bonds worth SR4 billion, according to Reuters. Lack of transparency is a real concern for foreign investors that Saudi Arabia wants to bring into an economy struggling from the collapse of oil prices. The BBC reported that the money collected from the Ritz settlements would revive the economy, since it is unlikely that oil prices will climb again. Sources told the Saudi newspaper Okaz that more than 90 people had been released, and another five were still in negotiations, including Mohamed Al-Amudi, as reported by Saudi journalist Jamal Khashogji in a tweet. Another 95 are still being detained. The Saudi authorities had arrested more than 200 influential figures, including princes, ministers and incumbent and former officials, and for the first time openly accused them of corruption. Many in Saudi Arabia have drawn a link between economic developments, the release of Bin Talal and other Saudi billionaires, and the Davos Forum on the one hand, and the current bickering among Saudi Arabia’s allies in Yemen. The in-fighting makes Riyadh’s position in Yemen more difficult because the conflict there has drained Saudi funds that were already depleted due to a drop in oil prices. Many Saudi analysts hope their country will withdraw from Yemen and focus on developments at home. For five decades, Saudi Arabia has relied on oil revenues as its sole source of income, and so far attempts to diversify revenue have failed, holding the country hostage to the fluctuating prices of fuel.